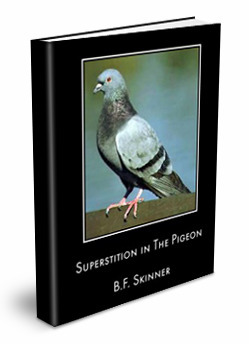 Thank you for making available the classic BF Skinner paper on superstitious pigeons. I recall seeing in the very early 70s film of the superstitious pigeons. I found the elaborate dances elicited from some of the birds, based solely on random reward, extremely compelling. Does anyone know if any of that film is available today? Or have any suggestions about where one might search for that film. My guess is that the film I saw was produced by a scholastic film company presenting an overview of Skinner's work intended for a high school or introductory college level student, rather than film directly released by Skinner. I have googled every possible iteration of Skinner, reinforcement, superstitious, random, pigeons, behaviorism and have yet to find anything online.